"Afghan women are unstoppable," says one viral tweet. Jahan Taab's photograph has been shared thousands of times on social media. A powerful photograph of a woman who took her university entrance exam while nursing her baby has taken social media by storm. 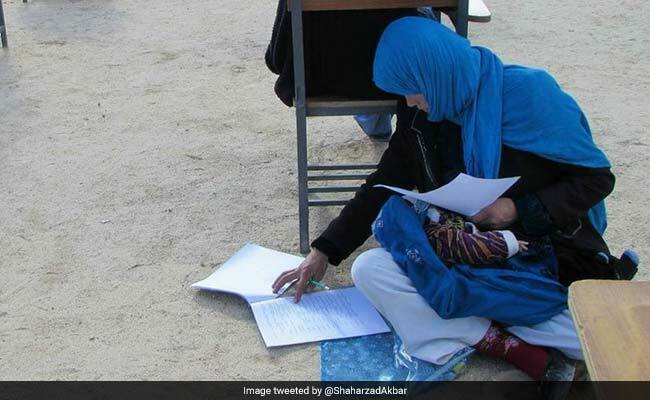 Jahan Taab, a 25-year-old woman from Afghanistan, was photographed sitting on the floor at a private university in Afghanistan's Daykundi province, reports CNN. She was writing an entrance exam - called the Kankor exam - for the social science course at Nasirkhosraw Higher Education Institute in Nilli city. It was during the exam that her two-month-old baby started crying. According to Yahya Erfan, a lecturer at the university who was monitoring the test, she got up from her desk, sat cross-legged on the floor and continued writing answers while nursing her baby. Mr Erfan took a few photographs of the powerful scene that played out in front of him and shared them in a Facebook post. Though the original post has now been deleted, the pictures have gone massively viral and have been re-shared thousands of times. People on social media love the image and what it conveys. "Afghan women are unstoppable," says one viral tweet. Many others have called Ms Taab "inspiring" and "a legend". "It was amazing and all of the classmates were in admiration of her," Mr Erfan told CNN. Ms Taab, who has three children, travelled over six hours to reach the city of Nilli. Though she has passed the entrance exam to gain admission at the university, she is now concerned that she may not be able to afford the tuition fees. The local Etilatrooz Daily newspaper reports that Ms Taab, who is married to a farmer, is keen to continue her education. A British organization, the Afghan Youth Association, has launched a GoFundMe to support Ms Taab's studies, calling her a "role model to thousands of other Afghan women who face similar challenges".